Christmas is a wonderful time of year in the floristry calendar. The colours you have to work with are rich vibrant and simply ooze warmth. On a cold winter’s day they brighten up any room. It is also a magical time of year so you must try and capture that in any display you do. Adding tartan bows to garlands, fairy lights to swags or wonderful golds, reds, greens and silvers to any display will just simply make you feel Christmassy. Just seeing a garland decorating the fireplace at Christmas will get you into the festive spirit, while swagging up a staircase will certainly add a touch of nostalgia to your Christmas Day and conjure up a Victorian feel. Cinnamon sticks, dried fruit and pine cones add fantastic smells to any Christmas display. They look fabulous on door wreaths or simply dotted around the Christmas dinner table.Indeed a lot of the materials used to make traditional Christmas displays can be found in the garden – make use of the evergreens and the pine cones – or in the kitchen – cinnamon sticks and fruit! Candles are also very popular in Christmas Displays – but please remember these should be for display purposes only and not actually lit as some material, particularly if you use artificial, is highly inflammable. The last thing you want is for your Christmas day to go up in flames – literally. 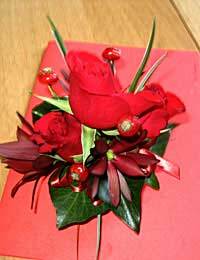 And obviously you can’t beat the old faithful – a poinsettia display beautifully wrapped, is a lovely Christmas gift. Now Christmas can be as brash and colourful as you want, with displays filled with baubles, glitter sprayed ferns and satin ribbon. Or you can add a few classic designs around the home to make it welcoming, such as a Christmas garland or wreath. But why not go for something different at Christmas? Forget bouquets, poinsettias or arrangements in a basket, instead add interest to your Christmas cake with a fabulous festive cake top decoration! These can also be used to adorn the Christmas table as stand alone displays designed to complement your festive colour scheme. Cake top arrangements can be made two ways – wired or in foam. The floral wholesalers sell a foam holder called an Iglu which you can fill with flowers and place directly on top of the cake. Wiring however gives you more flexibility and movement in the design although the principles of putting it together and the same for both wired and foam and fresh and artificial flowers. For Christmas it is lovely to have an all round pointed shape, reflecting the shape of the Christmas tree. It is also nice to use “Christmassy” colours such as reds and greens. Always make sure, if you are using fresh flowers, to spray the design before it goes on top of the cake. Never spray flowers in position as this could damage your cake, particularly if you have used icing.